Cops: Texas mom shot daughters so husband would "suffer"
FULSHEAR, Texas -- The father of two young women shot and killed by their mother Friday told police his wife wanted him to suffer, officials say. Police say Christy Sheats, 42, shot and killed her two daughters , 17-year-old Madison and 22-year-old Taylor, at the family's home outside the Houston suburb of Fulshear. Her husband Jason Sheats, 45, survived. Christy Sheats was killed by a responding police officer when police say she refused to drop her weapon. Jason Sheats was interviewed by the Fort Bend County Sheriff's Office Tuesday night, reports CBS affiliate KHOU. He reportedly told investigators his wife had several opportunities to shoot him as well, but he believes she wanted him to live and make him suffer by killing their daughters. "He felt Christy wanted him to suffer," said Sheriff Troy Nehls. "Christy knew how much he loved Taylor and Madison and how much they loved him." The shooting reportedly happened on Jason Sheats' birthday. Jason Sheats told police that he and his wife had been struggling with marital problems and had discussed divorce. The day of the shooting, he said his wife also got into a dispute with her eldest daughter, Taylor, reports KHOU. He said his wife wanted to ground Taylor and prevent her from seeing her fiance, whom she planned to marry Monday. Jason Sheats told police he disagreed with his wife. He said she called a family meeting and the four had gathered in the living room. Jason Sheats told police he thought his wife would tell their daughters that the couple had decided to divorce. Instead, he said, she pulled out a gun from the couch cushions and opened fire, KHOU reports. Both daughters were shot. Disturbing 911 calls captured the moments leading up to the shooting, during which the daughters can be heard screaming and Jason Sheats is heard begging his wife to drop the gun. Jason Sheats and the daughters ran outside, where Madison Sheats collapsed and died, police say. Jason Sheats ran to the end of a cul-de-sac. Taylor Sheats was shot again by her mother on the street. A neighbor told a 911 dispatcher that Christy Sheats went back inside to re-load her gun, returned and fired again at the young woman. When officers arrived, they saw Christy Sheats shooting Taylor the final time, the sheriff's office said. 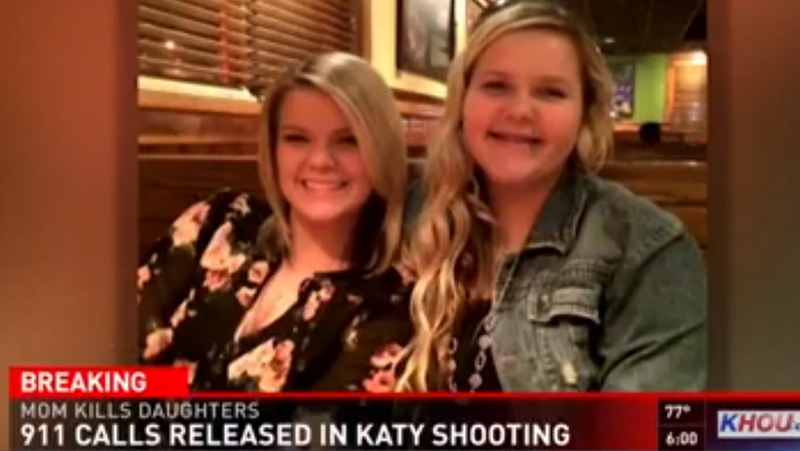 Madison Sheats was shot once in the neck, and Taylor Sheats was shot three times in the head and back, reports KHOU. Police say Jason Sheats told them his wife was taking several medications to cope with depression and anxiety. He said the woman had attempted to commit suicide three times, and had been treated at three private mental health facilities in the past four years. Police had responded a dozen times to the home since 2012, officials say, which included medical calls, a report of a verbal dispute between the couple, a response from a sheriff's office crisis intervention team, and a 911 call in which Christy Sheats said she wanted to speak with a deputy. Five were false alarms. Jason Sheats told police the gun his wife used in the shooting was a .38 caliber handgun she inherited from her grandfather. He said his wife had applied for a license to carry a handgun, but the state refused her application. At a press conference Wednesday, Fort Bend County Sheriff Troy Nehls said his office is investigating why she was denied the license. Jezebel reports Christy Sheats had expressed support on Facebook for her right to carry a semi-automatic handgun recently, writing: "It would be horribly tragic if my ability to protect myself or my family were to be taken away, but that's exactly what Democrats are determined to do by banning semi-automatic handguns."